The ‘America First’ policy of Donald Trump leaves a big window of opportunity for the EU in Asia, writes Geoffrey Harris. Geoffrey Harris is currently a visiting researcher at the Fudan Development Institute. He is also visiting Professor at the College of Europe in Bruges and the Xi’an Jiaotong-Liverpool University (XJTLU) in Suzhou. From 1976-2016 he was an official of the European Parliament. As with any major historical event, perspective is needed before concluding what really happened. The timing of Donald Trump’s visit to Beijing in early November was probably linked to the long-established date of the APEC summit in Vietnam a few days later. By tacking onto the programme visits to Japan, South Korea and the Philippines the tour seemed to contain more strategic substance than may really be the case. Certainly, the US President delivered several speeches and, according to him at least, the red carpets were probably bigger than anyone had ever seen, but what was his message to allies and rivals in the region and around the world? According to Trump, the visits and meetings confirmed his personal brilliance as a deal maker and certainly some big deals were announced in Beijing. He even offered himself as a great arbitrator supposedly able to help China and Vietnam resolve their territorial issues, although this did not appear to elicit much of a response from either country. According to the President’s critics the tour, in fact, really highlighted how far the US had ceded leadership in the region to others. In historical terms, the big event was the report by the Chinese President to the 19th Party Congress in which he made expressed a readiness for China to take a leading role in developing a global community of shared interests. Following his speech in Davos earlier in the year, President Xi Jinping seemed eager to occupy the empty leadership space left by Trump’s “America First” actions and rhetoric. Many US commentators saw Xi’s Beijing speech as a wake-up call to the West. 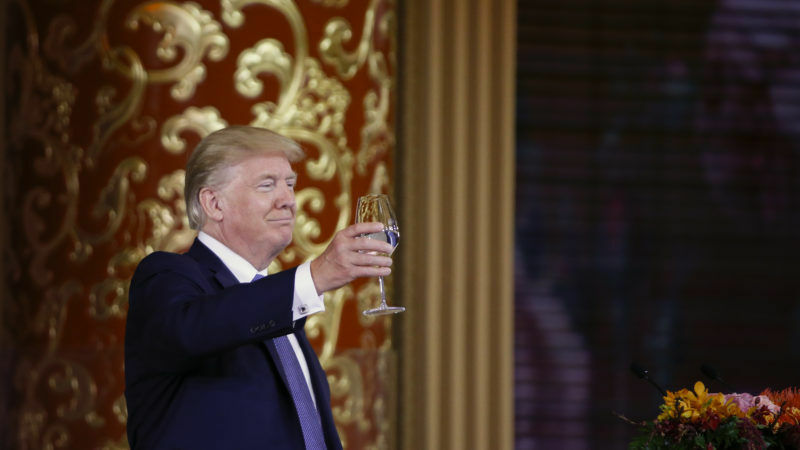 Trump congratulated Xi on a great political victory, but his dramatic, albeit welcome, abandonment of his almost xenophobic anti-Chinese rhetoric undermined his credibility and left unanswered questions as to his real intentions and strategy (if there is one). Business deals were announced but on the major security issue, namely the DPRK nuclear threat it is quite unclear if anything meaningful will result. For those in the US who until 2016 were helping advance the abortive Obama trade strategy, the administration looked increasingly as if it had been very effectively outmanoeuvred by Beijing and others. For the EU to maximise its own interests it will have to shore up unity and a shared approach to such issues as the Belt and Road Initiative with which some member states are much more comfortable than others. China and Europe have a well-established understanding and a functioning strategic partnership. China may sometimes feel disappointed that its positive embrace of globalisation is not met with recognition from Europe and the US that it is genuinely a market economy. Implementing the “opening up” foreseen by the 19th Party Congress could contribute to greater trust and unlock agreement with the EU on free trade, an investment treaty and acceptance of China’s Market Economy Status. Certainly, the EU is going through numerous political challenges, but it is not about to collapse. No-one plans to follow the UK out of the door and the economy is recovering. Instability in Europe’s neighbourhood brings many dangers as seen in the refugee crisis. China and the EU hold regular summits but without the spectacular elements that characterised the Trump visit. On substance both China and Europe have shown a common ability to follow long-term strategic goals which are in both sides’ interests. Most notably despite many changes of leadership on both sides they have avoided unpredictable and erratic positions and actions. They both accept that multilateral structures are as important as bilateral relationships. In the coming years Europe should respond to the vision of President Xi’s Beijing speech by providing an inspiring narrative of its own and rejecting the short-sighted “America First” narrow-mindedness. “These are times of change, and times of confusion. The global balance of power is shifting, alliances are evolving and changing, the system of multilateral global governance is often being questioned. And in a moment like this, we all need our cooperation, our partnership, more than ever. This is the context in which China and Europe must take the lead.